Through a three-year NASA grant, Koenig is analyzing how well the satellites orbiting Mars are doing their job. Specifically, she’s trying to find out how well the radars are picking up on various layers within the Martian ice on its North Pole. And the best way to know if things are working properly there is to test them here on Earth. Liquid water cannot exist on the surface of Mars, unless in briny form, because of the planet’s low atmospheric pressure and surface temperature. But a combination of frozen water and carbon dioxide covers both of its polar caps. Since Mars and Earth have a similar axis tilt, they have similar seasons. On the Martian poles, blackout winters sweep in carbon dioxide as snowfall, which vaporizes come spring. In its North Pole, frozen carbon dioxide grows one meter thick in winter, while the much colder South Pole has a permanent dry ice cover up to eight meters thick. That is why Koenig is looking to the north, where ice water dominates. 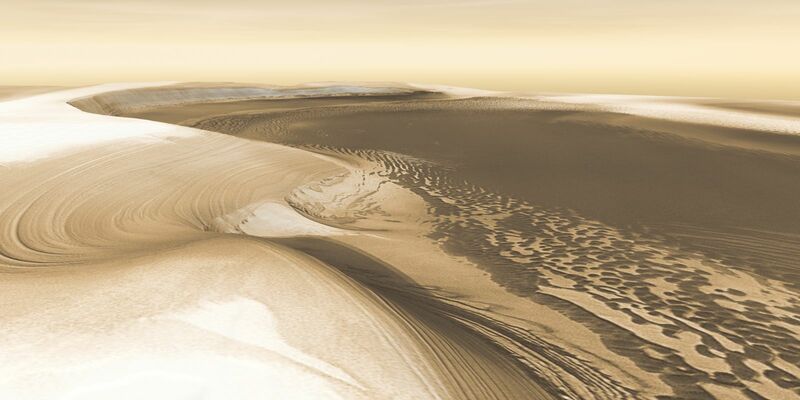 Martian ice is similar to Earth’s ice. It has layers. On Earth, darker layers come from volcanic or wildfire ash, but the majority of layer differences stem from changes in densities preserved over time, signifying snowfall at different temperatures. That is how ice cores tell us about Earth’s past climate. On the red planet, however, the layers have mostly been attributed to different dust and dirt concentrations. Though both of its polar caps show layers from seasonal melting and ice deposition, researchers have not yet analyzed these layers in depth. Reading into planet’s past climate hinges on radars reading the layers properly. To do so, Koenig needed to test the radars. “Radars are our remote eyes probing other ice sheets,” Koenig said. Here on Earth we can test how well they actually see. “Then we can send them to look at Mars, and we can use what we learn here to interpret the signals we get from Mars,” she added. Trying to understand something in an unreachable place is somewhat tedious. “This is a great project; the components are fun, but really we are just trying to determine a physical property of the radar reflection. In that sense, it’s a bit archaic,” Koenig said. “When we can’t physically go somewhere, we use sensors.” Radars offer a three-dimensional view that can dig deep into Earth’s remote polar ice sheets. By fully understanding the functionality of radar instruments, data can be better interpreted, so what these eyes see is accurate. 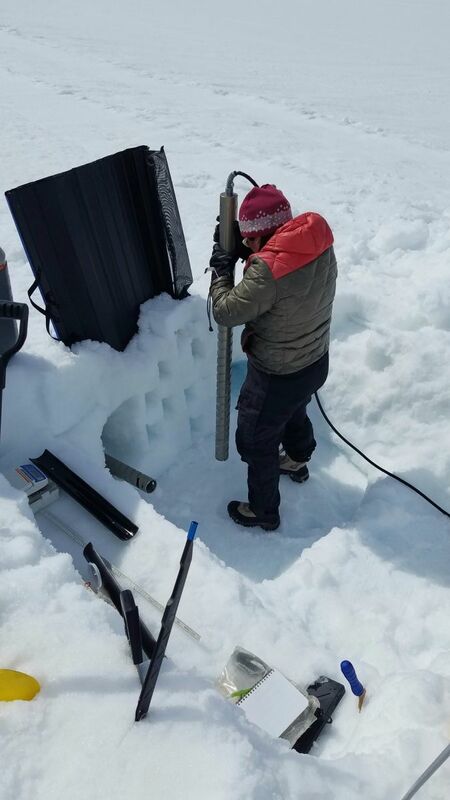 During the first year of the study, Koenig and her team of researchers decided to build their own ice sheet. 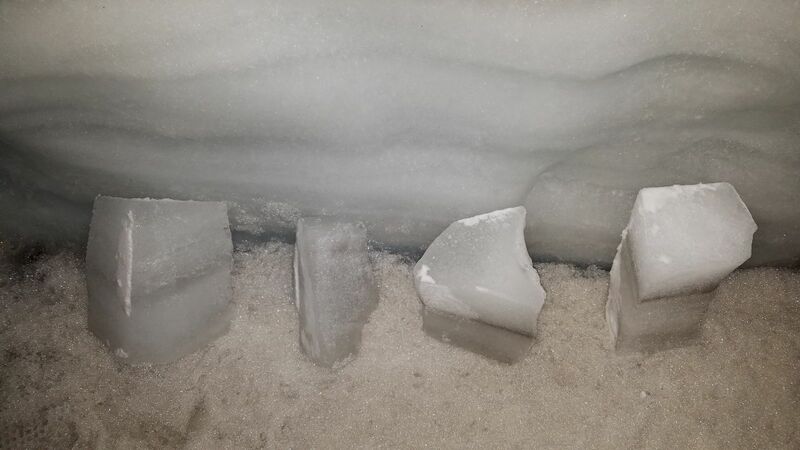 This experimental ice sheet was built in a big cold room at Cold Regions Research and Engineering Laboratory (CRREL) in Hanover, New Hampshire. While building it, the team could control the amounts of dust and density changes in the snow. Then they tested the radars, crawling through a slim sliver of air under the ceiling, to determine if the radar detected the proper percentage of Mars-simulant dust, specially crafted from Hawaiian volcanic ash. The second year, the team went to Iceland. “Because most of the ice we’ve collected is clean ice from Greenland and Antarctica, we went to Iceland to collect radar data over relatively dusty ice,” Koenig said. The volcanic ash from frequent eruptions in Iceland gave the team radar images of dust and ash layers, and ice core and stratigraphy data. “Now that we have all the data, we are just starting to process it,” Koenig added. Though the study has yet to reach any conclusions, Koenig’s analysis helps confirm what exactly these radars are picking up, and eventually, to unlock the mysteries trapped within Martian ice.